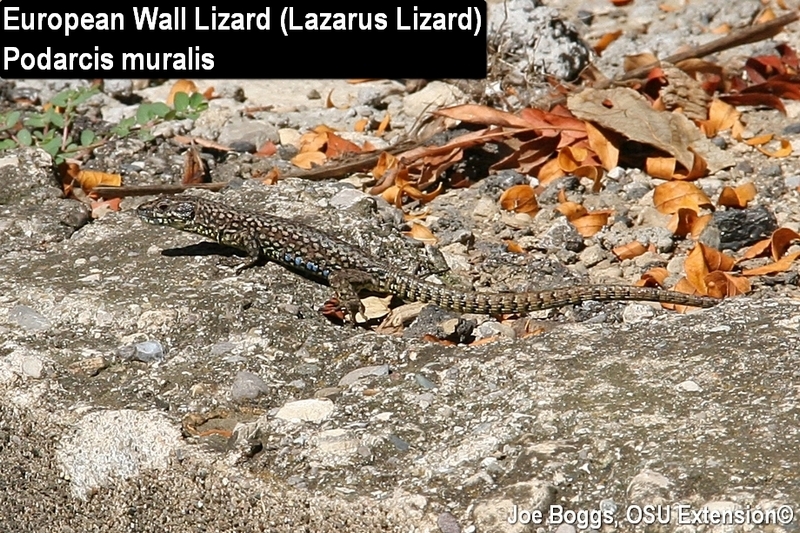 If you're hiking around Cincinnati on a warm sunny day and spot a lizard scurrying over rock walls or rocky slopes, it's likely to be the non-native European wall lizard (Podarcis muralis). However, if you ask a Cincinnatian to identify the lizard, they will most likely call it the "Lazarus lizard." This is one of the lizards capable of detaching their tail to survive a predator's attack; a defense mechanism known as autotomy. However, the local common name "Lazarus" has nothing to do with dropping a tail to rise again. It's associated with the Lazarus family best known in Ohio for their connections with department stores. In 1951, 10-year-old George Rau Jr., step-son of Fred Lazarus III, came across European wall lizards scurrying across rocky slopes while on a family vacation to Lake Garda in northern Italy located about 30 miles east of Milan. George smuggled a few (6 to 10 depending on the reference source) through customs to release them at his family's home on Torrence Court in the suburb of Hyde Park just east of Cincinnati. The climate in Milan is almost identical to Cincinnati and there are plenty of rocky habitats in southwest Ohio to accommodate the lizard's needs. The European wall lizards thrived and became so numerous that Torrence Court is still sometimes referred to as "Lizard Hill." The burgeoning Italian expats were locally renamed "Lazarus lizards" in misplaced recognition of their perceived patrons. Of course, they should have been named "George's Lizards." While the lizard story may seem like local lore, George Rau wrote a letter in 1989 to herpetologists at the Cincinnati Museum of Natural History detailing his role as the lizard trailblazer. He also repeated his story in several interviews with the news media. Research conducted by Cassandra Homan for her M.S. Thesis ("Bottlenecks and Microhabitat Preference in Invasive Wall Lizard, Podarcis muralis." University of Cincinnati, 2013) added credibility to Rau's claim. She compared genetic samples collected from the Cincinnati lizards and from the source population in Europe and confirmed a substantial loss of genetic diversity indicating a genetic bottleneck. Her computer simulations suggested the bottleneck was likely associated with only three individuals serving as the founders of the Cincinnati populations. The European wall lizards mostly feed on insects which mean they no doubt compete with one or more of our four lizard and skink species (order Squamata, suborder Lacertilia) native to Ohio. The non-native lizards are now found in pockets throughout much of Cincinnati and parts of the adjoining states of Kentucky and Indiana. Although their spread has been patchy owing to their requirement of rocky terrain or stone walls on south-facing slopes in order to survive winters, localized population densities may be as high as 1,500 per acre. Indeed, the species has been so successful in colonizing southwest Ohio, it is now included in the Ohio Revised Code. You will find "European wall lizard (Podarcis muralis)" listed among the names of native reptiles protected by law (Chapter 1531: Division of Wildlife; 1531.01 Division of wildlife definitions). A rare achievement for a non-native animal.